All Things Brantley, All Things Tribe: Where Are You, Chief Wahoo? 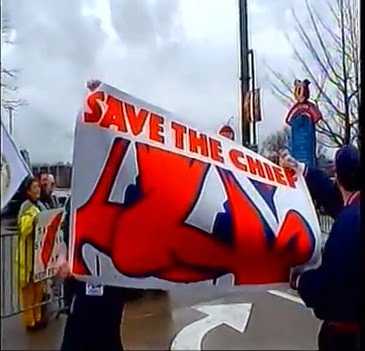 Save The Chief! Where Are You, Chief Wahoo? Save The Chief! have any of you Tribe fans noticed the gradual disappearance of the Cleveland Indians' Chief Wahoo? i'm sure you have. this has been a hot topic of debate for the last few years and i've kept my mouth shut long enough about it. i absolutely HATE how the Wahoo is being phased out in all aspects of baseball, including at Progressive Field, despite what the team states. 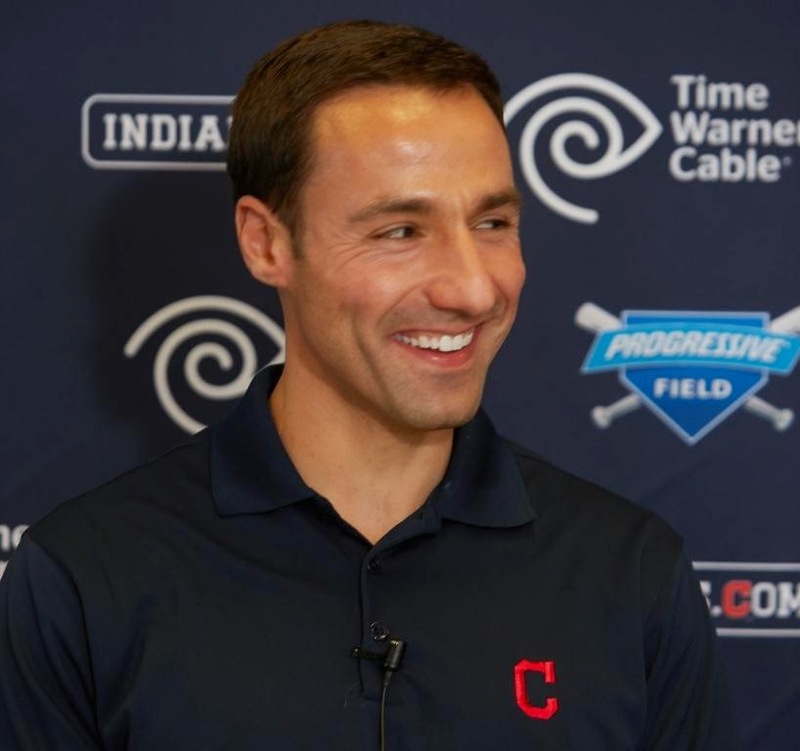 the Indians organization insists that they are not eliminating the Chief. but the truth is, they've scaled back their self-promotion of it quite a bit (more than i realized until i really thought about it), to the point where even the players themselves are rarely seen rockin' the Wahoo. in spring training, the Indians only wear the C on their jerseys and hats. 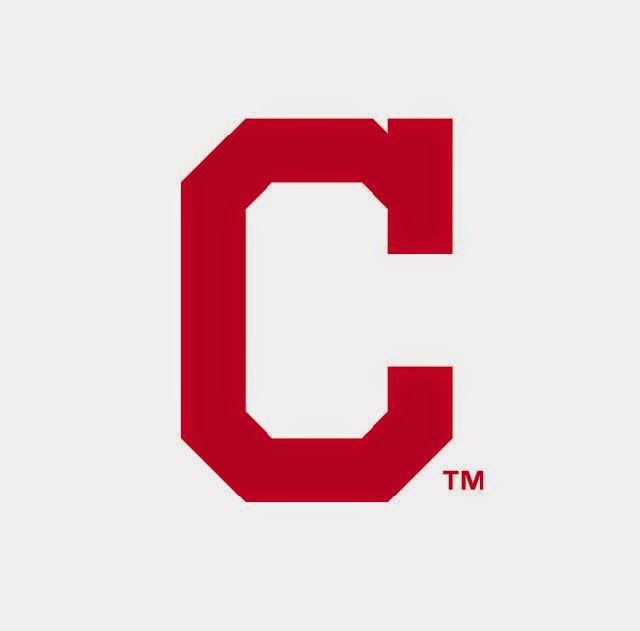 during regular season batting practice, their shirts and hats, again, only display the C, and all bp gear sold to fans also features the C. as for the game uniforms, players wear the hats with the Wahoo on them with just their blue jerseys and white home jerseys. luckily, the left sleeve of all 4 jerseys still has the Chief, but who knows how long that will continue. 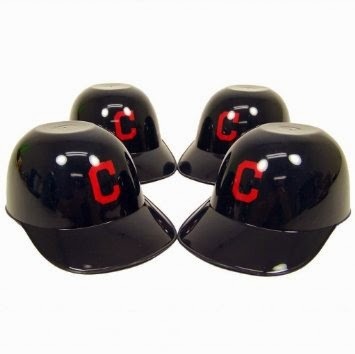 their batting helmets recently dropped the Wahoo for the C. even the mini helmets they put the ice cream in at the ballpark concession stands now exclusively have the C on them in place of the Wahoo. come on. plus, all Indians personnel currently wear shirts with only the block C on them. 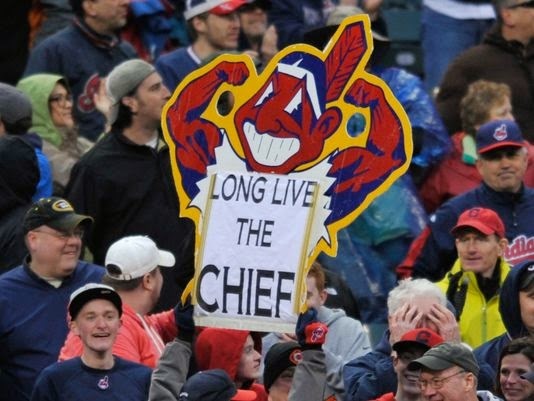 that to me sends a big message to the world about how they want the Indians to be viewed, and it is NOT by the Wahoo anymore. let me give you some more disturbing examples. on the scoreboard at the park, they no longer use the Wahoo in any capacity. looking back at the photos i've taken when i've gone to games over the last 5 years, i can say with confidence that this change happened just this past season, in 2014. now every time the Tribe is represented with a symbol, it's the "C," and the Chief is nowhere to be found. moving outside of Progressive Field, you'll find the same thing on the TV sports shows and news. 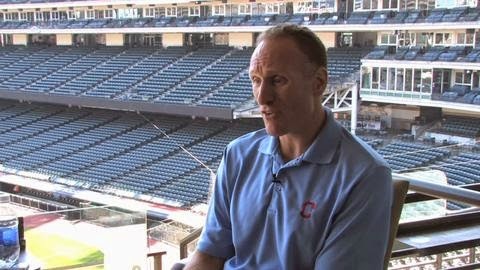 when they're talking about the Tribe, you don't see the Wahoo anymore; you see the C. on MLB Network, and probably ESPN too (idk cause i don't watch that channel), when they have their list of topics to discuss on the side, and the Indians are on the agenda, they're represented only by the C. even on the sports websites, the Tribe logo is the C. it may be the politically correct thing to do in the eyes of the media, but it actually came about because this C logo has unofficially become the Indians' primary logo, while the Wahoo has slipped down to its secondary. i say unofficially because the Indians have yet to formally announce this change in words, but these actions all speak loudly and clearly. the Indians used to be one of 3 teams in baseball that didn't use a letter or letters as their primary logo. now there are just 2 teams left standing, both in the American League, that use actual non-letter symbols to represent them: the Baltimore Orioles and the Toronto Blue Jays. sigh. i suppose it could always be worse. i mean, we could be like the Minnesota Twins. i promise you that someone who's unfamiliar with baseball would never assume that the overlapped "TC" on their hats stands for "Twin Cities" and represents the Minnesota Twins. at least we aren't that confusing i guess. so why did the C become more prominent in recent years? it's somewhat odd to me honestly, but more and more people have decided the Wahoo is racist and offensive to Native Americans. i always hear about the protesters coming out to Progressive Field before the Home Opener to bring more awareness to their cause. i've never seen them though because i get to the ballpark insanely early, early enough that i apparently avoid running into all that. anyways, it's obvious to me that the Indians are trying to appease the protesters by cutting down on their usage of the Wahoo. on the contrary, for every person who's against the Wahoo, there seems to be someone IN FAVOR OF the Chief. i don't know if that makes any real difference, but i deeply hope those people who are outwardly, openly, and proudly throwing their support to the Chief are enough to convince the organization not to entirely rid the Indians of the Wahoo. this all just begs the question, why is the Chief so offensive now when it wasn't a century ago? smh. the first Chief Wahoo logo didn't appear until 1928. did different groups initially start getting riled up about it back then? or did it all begin when the image took on the present-day cartoon-like Wahoo? because, if anything, i would have thought the evolution into this caricature of a Chief detached it from the group of real life Native American Indians, and consequently wouldn't be offensive to them since it was no longer pictorially tied to those Indians. if you're up on your Cleveland Indians logo history, then you know the first couple of Chief Wahoos resembled an actual Indian. were people just as pissed about that? 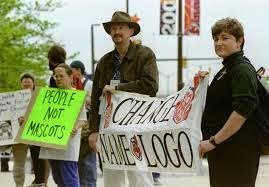 were they demanding a logo change then, too? cause that i would understand, but considering the design of the current Wahoo, i don't agree with the protesters' stance on the issue. look at all the Tribe logos--carefully. the Chief logo, once it started reflecting an Indian, was revised several times after the first one was revealed. as of 1946, the Wahoos have only contained 1 feather. Walter Goldbach, creator of the cartoonish character, stated that since then, technically, we have all been mistakenly referring to him as Chief Wahoo, when really he is not a Chief anymore because he's no longer sporting a full headdress. i feel like that fact only adds to my case about it being the opposite of offensive. and can i also quickly address that the Chief isn't even the team's mascot, as some people incorrectly argue? 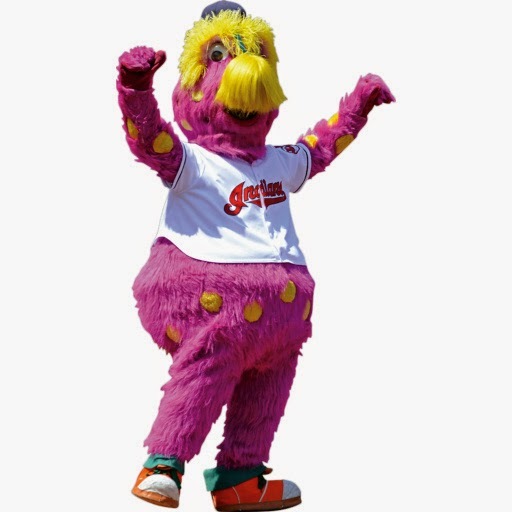 we have Slider, who for all intents and purposes is a made-up kid-friendly fuchsia creature (not even a real animal, mind you), completely unrelated to ALL Indians--the Cleveland team AND the racial group. nobody is dressing up as a Native American parading around the ballpark as an official Tribe mascot. the Wahoo is simply a team symbol. so again i ask, what is all the vitriol about?! sadly, the issue isn't even solely with the Chief. he's half of the dispute, but the other half concerns the team name. a lot of people want a name change in addition to a logo change. in my opinion, that's too far. and i can't help but wonder if the protesters recall how the Indians name was established, because there's nothing disrespectful or inappropriate surrounding its formation. for those fans who don't know the story of how the Indians got their name, i'll tell you. from 1903-1914, the Indians were called the Cleveland Naps after player-manager Napoleon Lajoie, even though he was widely referred to as Larry. after the 1914 season ended, owner Charles Somers was broke and the team needed to cut payroll. (some things never change, huh?) so Nap was traded to the Philadelphia Athletics, literally given away just so Somers wouldn't have to pay his then-expensive $9,000 contact. at that point, it was decided that they needed a new team name. Somers asked several writers from the Cleveland News, the Cleveland Press, and the Plain Dealer to run a contest to rename the team. once they got some names from the fans, they would all get together and make a decision. 30 different suggested names were chosen to mull over, but Indians wasn't one of them. the intentions behind the name were pure and in no way defamatory. the name was supposed to be an inspiration to the players to play hard and never give up. besides, if some people see it as a tribute to Native American Sockalexis, then how can Native Americans today be upset by that? 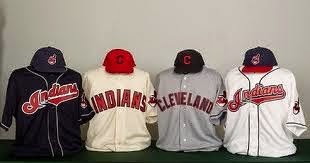 i am going to be fuming if one day the Indians decide they have to change their name due to all this controversy. i'd seriously be sick. 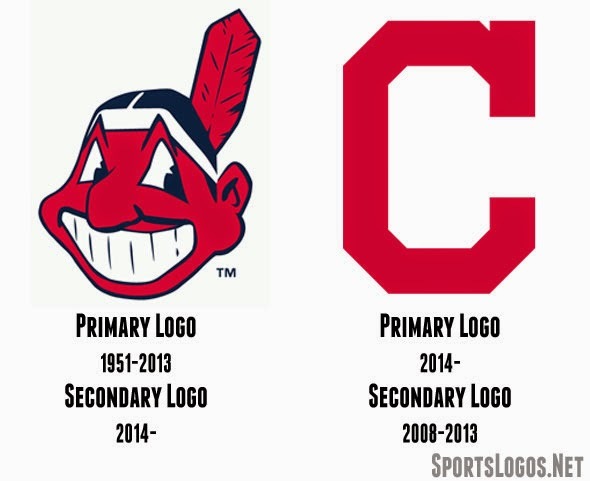 so with the team name Indians, what other kind of logo would you expect? yes, Cleveland started out with the C, but it needed to be updated. and now that you know how the Indians got their name, you know it was never meant to be offensive and, as a result, neither was the Wahoo logo. i feel like some people are trying to make way more out of this whole issue than is necessary because they may not have been fully aware of the history regarding the name. and once again, how is it that people loved the name Indians back in 1914, but not in 2014? as time passes, we are supposed to be making progress in the area of racism and be more open-minded about things. in spite of this, there are people who remain more sensitive than ever about topics such as this. so i'm confused. are you telling me that a hundred years ago, people were more tolerant than people in the world today? at this point i'm like, everyone who's pissed now can take it up with the people who started this thing in 1914. oh wait, that's not possible. i cannot and will not tell any group of people how to feel about this subject. i can't change your mind any more than you could change mine. but i can provide strong reasons to back up my feelings. 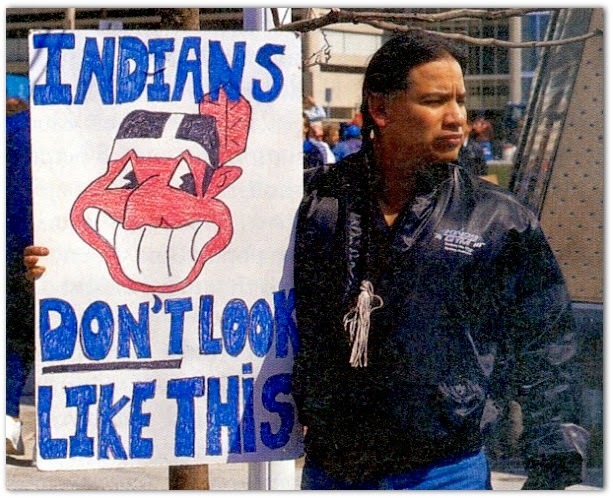 i'll also suggest that maybe all those opposed could try to see the other side and not take the Indians' name and logo so literally to the point of offense. they were never meant to represent the entire group of Native Americans. therefore, is it really something for people to get offended over and protest against?